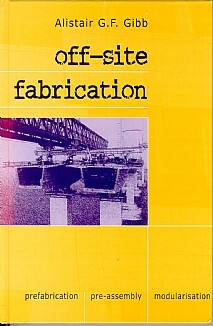 A complete guide to the whole topic of off-site fabrication is one of international interest, providing as it does an effective construction technique in terms of quality, time, cost, function, productivity and safety. It is adopted worldwide as the ideal means of producing an immense array of elements from structural members, cladding units, bathrooms to fully finished modular buildings. This book provides a complete guide to the subject, by considering the principles, context, applications and implications and in great part consists of many illustrative case studies. Context: Scope; Codification; Historical and international context. Principles: Time; Cost; Quality; Predictability and productivity; Safety, health and environment; Interfaces and coordination; Implementing innovations; Re-usability and re-locatability; Project-wide strategy. Applications: Residential; Light industrial; Commercial; Retail; Institutional (schools/universities); Civil engineering; Engineering construction; Offshore -|- Building services; Temporary/re-locatable/emergency; Remote sites; Refurbishment. Case Studies: Consists of numerous international examples. Implications: Procurement strategy; Design implications; Information technology; Pre-installation trial assemblies; Transportation and installation; Optimising on-site work; Retraining. Action: Project-wide strategy for off-site fabrication; Project characteristics; Applying the strategy to maximise benefits. Bibliography; Index. Practitioners, researchers and students in civil and structural engineering, building and construction, construction management and related subjects.